So quick and easy to put together, this is sure to become a summertime favourite. Wash the potatoes and cut into slices. Peel and finely chop the shallot. Trim the mangetout and rinse under running water. Wash the rosemary. Warm the oil in a saucepan. Add the shallot, rosemary and chilli flakes if using. Cook for a couple of minutes. Add the potatoes. Season with a pinch of salt and cook on a medium heat for about 5 minutes, stirring frequently. 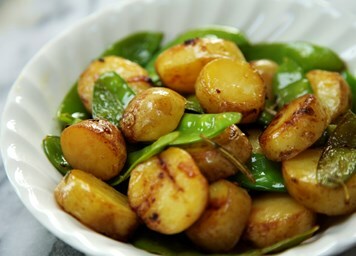 Add the mangetout and cook for another 12-15 minutes until the potatoes have turned a golden colour.